Safa Al Ahmad has spent the last three years covertly filming a mass uprising in Saudi Arabia’s Eastern Province that had, until her film, gone largely unreported. She did this in a country where those accused of dissent can face execution and travelling solo as a female is restricted. Al Ahmad’s 30-minute documentary, Saudi’s Secret Uprising, gave a rare glimpse of civil unrest from the region when it was broadcast by the BBC in May 2014. Since her important documentary aired Al Ahmad has faced extensive and violent online threats, and has been advised for her own safety not to return to her country. 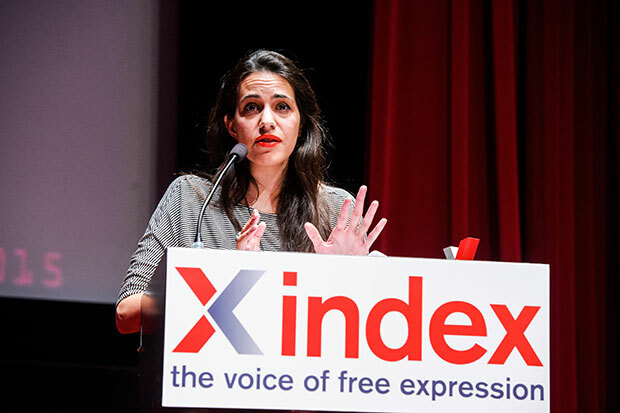 She is the joint recipient of the 2015 Index on Censorship Freedom of Expression Award for Journalism. Saudi Arabia is a mystery, even to its own people. Parts of our history deliberately concealed, the present muddled with rumours and half-truths. The government-owned and controlled media play a major role in the dissemination of those false realities of ourselves and others. This makes facts a precious commodity in Saudi Arabia. The uprising in the east of Saudi Arabia is a perfect example of how well the government has succeeded in controlling the story and the narrative around an unprecedented event in modern Saudi history. And it also exposes the failure of media in not cutting through the government’s narrative. Since the protests started in Qatif in early 2011 along with the rest of the Arab world, youth were arrested and given death sentences for posting on Facebook, like Mohmed Alnmir. Poets like Adel Al Labad, and human rights activist Fathil Al Manasif were given 15 year sentences for threatening “social stability”. So called anti-terrorism laws were introduced to criminalise most forms of dissent. For the film I made that tells this story, and shares my opinions, I have been accused of lying and spying, advocating terrorism, aiding and abetting terrorists, and of course I have been called a heretic. As a journalist in the Middle East people think they have the right to constantly ask what religion or sect you belong to and judge your work accordingly. It has become nearly impossible to do a story without talking about Sunnis and Shia. But sectarianism is used as a tool, as a weapon, to further confuse and tangle an already complicated political landscape. It has become acceptable reductive language in the media, both Arab and western, to explain our world. In Saudi Arabia, it was used to isolate and crush a fledgling uprising. A clever way to stop the rest of the country from joining those who have the same demands – to stop political oppression, free political prisoners, have transparent and just courts, stop corruption, and have equal rights for all citizens. But in the end, the uprising became reduced into a story of “Shia” minority protesting the majority Sunni rulers. A true statement at face value, but not the whole complicated, messy truth.